Many people ask us is what is the difference between scope 1, 2 and 3 emissions? Emissions are broken down into three categories by the Greenhouse Gas Protocol in order to better understand the source. 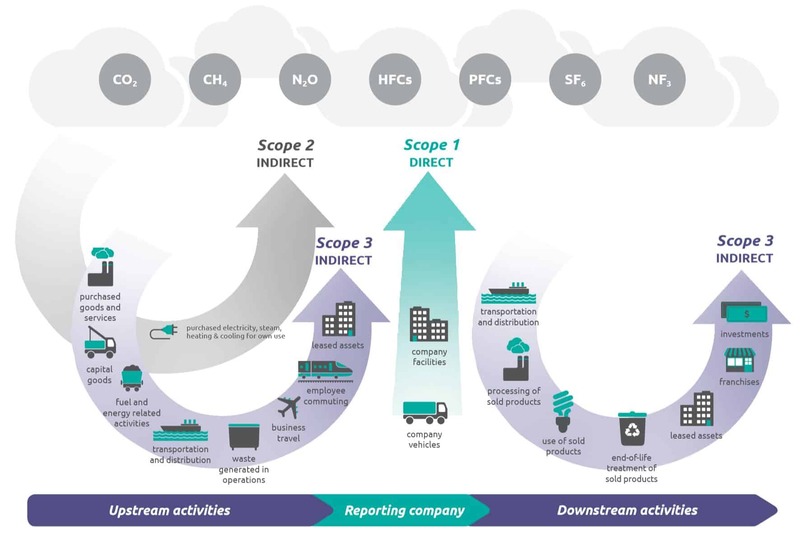 Scope 1 – All Direct Emissions from the activities of an organisation or under their control. Including fuel combustion on site such as gas boilers, fleet vehicles and air-conditioning leaks. Scope 2 – Indirect Emissions from electricity purchased and used by the organisation. Emissions are created during the production of the energy and eventually used by the organisation. Scope 3 – All Other Indirect Emissions from activities of the organisation, occuring from sources that they do not own or control. These are usually the greatest share of the carbon footprint, covering emissions associated with business travel, procurement, waste and water. We have also produced a useful glossary for terms associated with Compare Your Footprint and a guide to why your business should be carbon footprinting. https://compareyourfootprint.com/wp-content/uploads/2016/10/logo-1.png 0 0 Will https://compareyourfootprint.com/wp-content/uploads/2016/10/logo-1.png Will2018-11-02 10:32:122018-11-02 10:32:12What is the Difference Between Scope 1, 2 and 3 Emissions?